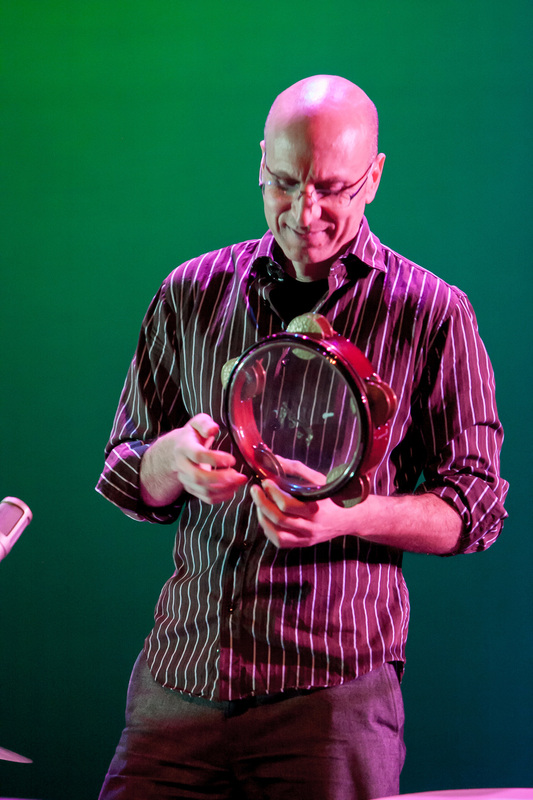 River Guerguerian has been inspiring audiences with his ecstatic and versatile percussion for over 30 years. Whether playing with world-class symphonies or studio musicians, partnering with Grammy-award winning composers, or creating dynamic plays of rhythm for his own projects, River’s passion and attention to the vibrant life of the drum reverberates throughout the crowd. Born in Canada of Armenian-Egyptian extraction, River’s successful and prolific career started at an early age. In 1989, he received his Bachelor of Music from the Manhattan School of Music Conservatory and graduated with the school’s award for Most Outstanding Percussionist. In 1988, he began creating works with Grammy and Oscar-winning composer, Tan Dun. Over the next several years he continued to tour with other artists performing in concert halls in Tokyo, Moscow, Rome, Berlin, Hong Kong, Barcelona, Jerusalem, Athens, Istanbul, London, including such renowned venues as Carnegie Hall, Sydney Opera House, and Lincoln Center. In 1994, River sold all his possessions, left civilization for five years, and lived in a wildlife sanctuary in the Himalayas. An immersion in nature initiated intense research and experimentation into the physiological effect of sound on brainwave states. River continued his investigations into trance-inducing instrumentation as he traveled to different cultures learning unique methods and techniques. Drawing on this diverse background, River plays all genres of music pulling original sound from Frame Drums, Middle Eastern and Afro-Cuban percussion, Drumset, Marimba, Tabla, Kanjira, Cajon, Gongs, Singing Bowls, Loopers, and various found objects. His compositions have been commissioned and performed by chamber ensembles, universities, modern dance companies, and new music festivals. River Guerguerian’s music has evolved through explorations of indigenous instruments, and their trance-inducing effect, gathered from travels around the planet. His compositions have been commissioned and performed by chamber ensembles, universities, modern dance companies, and new music festivals. As a studio musician, he has recorded on over 150 albums and film soundtracks, including the John Cage documentary film, “I Have Nothing to Say and I Am Saying It”. He has performed and/or recorded with such groups as the BBC Symphony Orchestra, New Music Consort, Tibetan Singing Bowl Ensemble, Paul Winter Consort, Talujon Percussion Ensemble, Chuck Berry, Sophie B. Hawkins, and Ziggy Marley/Gipsy Kings. He also records percussion tracks for artists at his own recording studio. Since 1999, River has been living in the mountains of Asheville, NC with his wife and three daughters. He travels internationally with Turkish master musician Omar Faruk Tekbilek. You can also hear his lyrical style as a soloist with The River Guerguerian Project, his world jazz trio Free Planet Radio, and the global Americana group The Billy Sea.